The Camp at Teaneck Creek, offered by the Teaneck Creek Conservancy in collaboration with the Teaneck Community Education Center, and funded by the Puffin Foundation, will provide a wonderfully creative end-of-summer experience for Teaneck children entering grades 2-6. Camp will be held in “the Great Outdoors” on the grounds of the Teaneck Creek Conservancy and in the Puffin, at 20 Puffin Way, from 9:00 a.m. - 2:00 p.m., August 10-14 for 2nd and 3rd graders, August 17-21 and 24-28 for 4th, 5th and 6th graders. (Note: Campers entering grades 4-6 may register for one or two weeks as each session with introduce new activities and adventures. Exciting programs, run by experienced teachers, will stimulate the imagination, develop new skills, encourage collaboration, provide intellectual stimulation - and hours of fun! Thanks to a generous grant from the Puffin Foundation, the cost per child will be just $135 per week and will come with an added bonus: an included special rate membership to the Conservancy. Since there are spots for only 15 children in each session, early registration is recommended. During the first week, campers entering grades 2-3 will enjoy two wonderful Hobby Quest programs. Kids and Cameras - New Techniques in Photography will provide children with professional quality digital cameras to point, click, and capture scenery and people through a lens. There will be an exhibition of camper’s photographs at the end of the session, an online “gallery” of their work, and an album of their pictures to take home. In Making Magic, a real magician will provide the tools and secrets that ensure mastery of tricks that will wow audiences. Magic tricks created by campers are theirs to keep at the end of the session. During weeks two and three, campers entering grades 4-6 will participate in Fairy Tale Trials - Out of the Woods and Into the Courtroom, an award-winning program that introduces concepts of ethics, justice, and fairness by giving fairy tale trials a day in court. Children participate as lawyers, witnesses, defendants, and storytellers as they explore moral dilemmas at the core of each tale, and learn about our legal system while doing it. Finally, they will present a case to the jurors and a verdict will be rendered. Nature and Discovery, the second program offered during weeks two and three, will involve children in an exploration of the Teaneck Creek. They will get wet in the stream, dig in the dirt, and look under rocks to discover and learn about the importance of this natural area - what lives here, how humans impact the area, and more. Campers will have fun creating art and writing short haiku poems inspired by their finds in this diverse nature park. Applications are available at the Teaneck Community Education Center, One Merrison Street; The Puffin Foundation, 20 Puffin Way; and at the Teaneck Public Library. If you have questions or would like an application mailed to your home, please contact the Center (201) 833-5514 or Karen Yucht, Program Coordinator (201) 836-0142. Garage Theater Group "Lost in History"
SUNDAY, MAY 3 AT 3:00PM Final Performance! BY CAR: Route 4 to River Road. Parking is free in the FDU lot off Route 4. BY BUS: New Jersey Transit has several buses that stop at FDU from both the George Washington Bridge and Port Authority. New York — On May 9, 2015, the Abraham Lincoln Brigade Archives (ALBA) will present the ALBA/Puffin Award for Human Rights Activism to the Association for the Recovery of Historical Memory in Spain (Asociación para la Recuperación de la Memoria Histórica, ARMH). One of the largest monetary awards for human rights in the world, this $100,000 cash prize is granted annually by ALBA and the Puffin Foundation to honor the International Brigades and connect their inspiring legacy with contemporary causes. On Saturday, May 2, 2015, the Museum of the City of New York will host the 3rd Annual Teaching Social Activism in the Classroom Conference. Educators are invited to present and participate in this free full-day conference, which will highlight the various tools and techniques used by teachers to engage their students in the history and practice of social change, inspired by the content of the Museum’s groundbreaking exhibition, Activist New York. Educators, activists, and historians will present their work to one another and will discuss the best practices for teaching this important subject to students of all ages. We also invite you to add your voice to the conversation! How do you teach Civil Rights? How do you introduce students to the past and prepare them for the future? The date of this year's activism conference sits squarely between the 50th anniversaries of Selma and the Voting Rights Act. In honor of this legacy, the conference theme is Teaching Civil Rights: Then and Now. We invite you to learn more about our theme, how to submit a proposal, and how to register. Proposals to present must be submitted by Monday, March, 30. The Teaching Social Activism conference is made possible by the generous support of the Puffin Foundation Ltd. Activist New York is the inaugural exhibition in The Puffin Foundation Gallery, which is dedicated to the ways in which ordinary New Yorkers have exercised their power to shape the city's and the nation's future. Because of an oil boom in the Bakken region of North Dakota, up to thirty CSX trains carrying toxic and highly volatile crude oil pass through Bergen County every week. These trains - up to 100 cars-long – pass over the Oradell Reservoir, source of drinking water for 750,000 people! You are in the blast zone if you live within ½ mile of the Freight Train River Line. (Check www.explosive-crude-by-rail.org) You are at risk, too, if you drink and bathe with clean water in Bergen County. It’s time to tell our leaders: This is unacceptable! 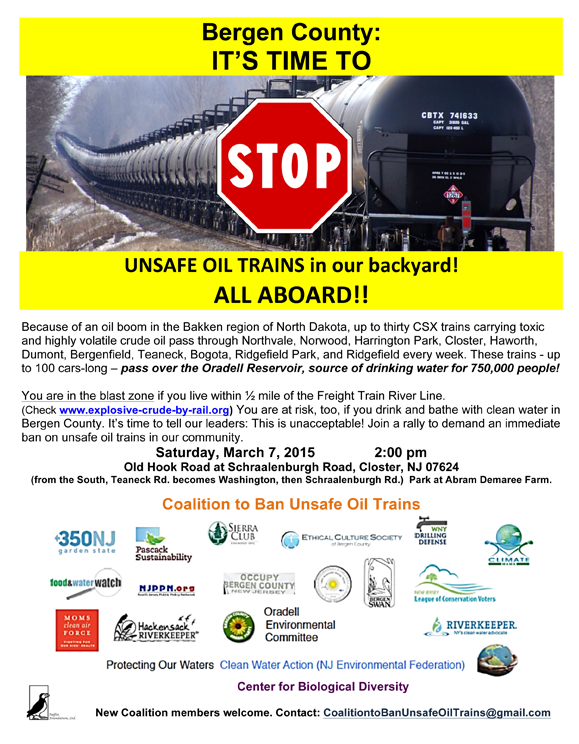 Join a rally to demand an immediate ban on unsafe oil trains in our community. (from the South, Teaneck Rd. becomes Washington, then Schraalenburgh Rd.) Park at Abram Demaree Farm. Now on Display at Puffin: "Retrospective Outrage"
On view through February 26th, the Puffin Cultural Forum presents the works of late political artist, Hak Vogrin. Vogrin was an artist who reflected his personal pain and outrage regarding the issues of his day onto the canvas; destruction of the environment, wars, torture, social injustice, racism, consumerism are tackled with a cartoon-like directness that reflected his work as an underground comics artist in the 60’s and 70’s. His paintings are colorful, expressionistic, and unabashed in their message and assertive nature. Although Vogrin passed away in 2009, the urgency of the themes addressed in his artwork are seemingly more relevant now than ever. Largely self-taught, Vogrin’s cartoons initially emerged in the underground comics movement of the 1960’s. His work appeared in the first issue of Yellow Dog, described as America’s “first underground comic weekly.” Throughout his life he created paintings and drawings the size of postage stamps, as well as those on large canvases. Although his sketches were often delicate, the paintings he produced towards the ends of his life were powerful, and produced in a bold graphic style with vivid colors. “When I paint, I think what I do comes out of chaos,” he told The New York Times in 2001. In addition to Vogrin’s work, this exhibition will also include prints of contemporary political cartoons from Daryl Cagle’s Cagle Post. Cagle is America’s most widely syndicated editorial cartoonist, and his syndicate, Cagle Cartoons, distributes the cartoons of over sixty editorial cartoonists and fourteen columnists to newspapers around the world. Many of the images, perhaps too many, deal with the same issues that Vogrin dealt with, albeit from a humorous perspective. In light of the recent Charlie Hebdo attack, these editorial cartoons from various cartoonists are an even more powerful reminder of the importance of political artistic expression in our society. The exhibit is being updated to include cartoons responding to the terror attacks in Paris. Regular gallery hours are Tuesdays through Thursdays, 12 to 4 p.m. or by appointment. The Puffin Cultural Forum is located at 20 Puffin Way (off Teaneck Rd.) in Teaneck, New Jersey. HAK VOGRIN: was born in Brooklyn in 1920, and began drawing comics as a child. In his early years, he worked on a commercial fishing boat in the Gulf of Mexico, and in a position as a margin clerk for Merrill Lynch. Around the time that Vogrin’s cartoons found an audience in the underground comics movement, he and his wife Jean opened a gallery in their apartment—“The One Flight Up.” Although Vogrin was not particularly interested in selling his work or seeing it exhibited, he participated in shows at the Noyes Museum of Art, the Long Beach Island Foundation for the Arts and Sciences, and in a New York show featuring the art of “Weird New Jersey.” His drawings and illustrations were included in publications such as Liberation Magazine andThe Realist, and in WBAI program guides and small press literary publications. Although his works were satirical and ironic, they always maintained their whimsical quality. In his last decade, Vogrin’s paintings specifically focused on sexuality and politics.